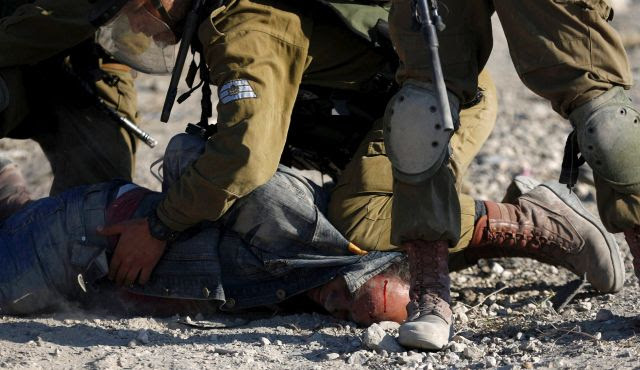 IDF soldiers were captured on video Friday beating a Palestinian man, even after forces had restrained him after he was arrested in a protest in the Palestinian refugee camp of Jalazone this Friday. [ video below]. During the demonstration, clashes erupted between Palestinians and forces from theNetzah Yehuda Battalion – a predominantly religious military outfit from the Kfir Brigade – that were caught on video by local Palestinian media. In the video, a soldier is seen cursing a Palestinian man, which the forces claim tried to touch their gun. The soldier can be heard screaming expletives at the Palestinian, taunting him to talk back, and vowing that should he say one more word then he will “f*** his mother.” The soldier then proceeds to attempt to hit him and a few seconds later another soldier is seen swinging his rifle at the Palestinian, who has words with the soldiers and attempts to push them away. After the initial altercation, the video shows a group of five soldiers trying to overtake the Palestinian, violently hitting his hands and legs. The video also seems to show two soldiers holding the Palestinian man, with a third standing behind him, as a fourth soldier hits the Palestinian with his rifle, causing him to collapse. While on the ground, a fifth soldier is seen punching him in the face, while another soldier kicks him in his face. 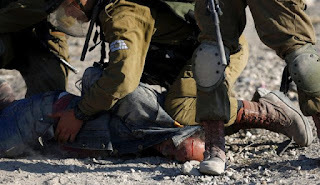 Another soldier then pins the Palestinian to the ground by stepping on his head, and his face can be seen to be bleeding. The video ends with the forces taking the now handcuffed Palestinian away. According to an initial investigation conducted Saturday morning, the soldier reported the arrest, but failed to mention the events as they were caught on video. The IDF claim that the incident took place after Palestinians pelted the forces with stones and the clash erupted in the Jalazone refugee camp. According to the IDF, the soldiers fired rubber bullets, injuring one Palestinian, and then fired live round into the air in an attempt to disperse what they described as a riot. The IDF noted that the commanding officer at the scene was himself lightly wounded after a stone struck his head. Like Window into Palestine help us in our time of need!